Rosehip seed oil has been a trendy skincare oil for some time now, but it wasn't until I noticed that I had some sunspots collecting on my cheeks that I decided to give it a shot. Rosehip seed oil, which is derived from the seeds of a wild rose bush, is known for its reparative and restorative qualities. The oil is high in essential fatty acids and Vitamin C, and has a surprisingly fast-absorbing and not greasy, making it a great "dry oil." Rosehip seed oil is most often used to hydrate dry or mature skin, correct sun damage, hyperpigmentation, scars and dark spots, and minimize wrinkles, fine lines and stretch marks. Like most other carrier oils, it can also be used for other purposes -- most commonly on the nails and in the hair and scalp, and as a massage oil. It's a medium orange color, and has a slight scent -- to me, a hybrid of fish oil and carrots -- that dissipates. To get the most out of rosehip seed oil, experts say you should look for the organic, cold-pressed oil, and it should be kept in dark glass bottles in the refrigerator between uses, as it goes rancid after about 6 months without preservatives. 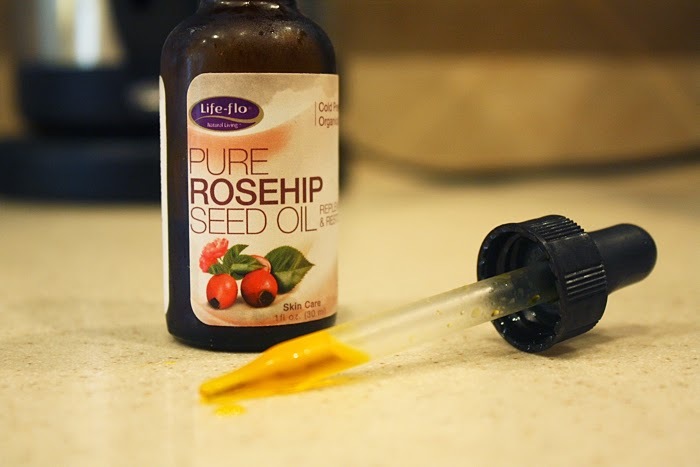 I searched the internet for the least expensive yet well-rated rosehip seed oil, and I settled on the Life-Flo brand, which contains Vitamin E as an antioxidant and helps the oil last longer. I've been using the oil for about four months now, and I can tell you that this is an incredible oil for fading any hyperpigmentation. I applied this to the remnants of a few inactive pimples, and the discoloration faded much faster than it had in the past. Similarly, it helped fade potential scarring on my legs after a particularly itchy and scratchy winter. But what I bought it for, really, was sunspot fading and unfortunately I haven't yet seen any results. I have read that it takes anywhere from six to 12 months to see a difference. Which brings me to another observation of rosehip seed oil: it is for extremely dry or mature skin. I consider myself to have normal-to-dry skin, especially dry in the wintertime, but still rosehip seed oil was too much for my skin to take, though it's not particularly thick. Since I was applying this primarily on the tops of my cheeks and the bridge of my nose, the oil did spread a little to my undereye area, and it was not good. After just a few days, I noticed that little bumps were developing in my eye area, and I discontinued use of the oil. And within a few days, the bumps disappeared. Now I use it only a couple times a week, and at this rate, I don't think I'll be seeing much change to my sunspots. I did use rosehip seed oil in a body butter recipe, and I found that it helped give the butter a more velvety texture. Overall, I would highly recommend this as a treatment to prevent scarring and as an additive to your natural skincare recipes, but I wouldn't necessarily recommend it as an all-over facial moisturizer unless you have mature skin or really dry, damaged skin. Many people recommend adding a couple drops to your nighttime moisturizer, but I too found that to be too rich for my skin. I would definitely not recommend this to those with oily or acne-prone skin -- in fact, I found that in the oiler areas of my face, the rosehip seed oil seemed to cause pimples. For now, I am using up my supply of rosehip seed oil and looking into camellia oil, which is said to have very similar properties to rosehip seed oil and also fast-absorbing and non-greasy. Have you used rosehip seed oil? What was your experience with it like? I haven't heard too many people complain about how rich the oil is, so I'm wondering whether it's just me.